You know something? That Dana White guy must really like coming over to Britain, otherwise he wouldn’t have given us two UFC shows in very quick succession. 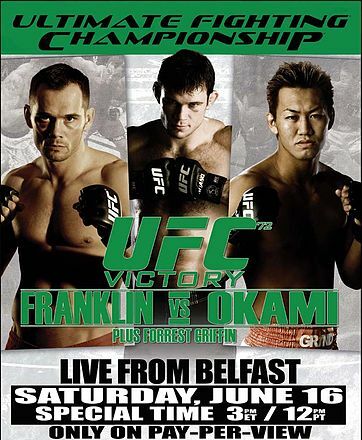 So, following their success at the MEN Arena in Manchester, they’ve come back again, this time to the Odyssey Arena in Belfast with UFC 72: Victory, featuring the likes of Rich Franklin, Yushin Okami and Forrest Griffin, shown live on pay-per-view on the Setanta Sports PPV channel. As always, out hosts for the evening are Mike Goldberg and Joe Rogan. The show begins with action from the middleweight division between Ed Herman and Scott Smith. This was a great opener. Herman and Smith exchanged moves early on the mat, before Herman opened up a nasty cut on the bridge of Smith’s nose with a series of hard elbows, turning him into a bloody mess. Thankfully, the doctor allowed him to carry on, but in the second round, after escaping from a guillotine, Herman synched in a rear naked choke to get the tap out victory. Both guys looked impressive here. It’s then down to the lightweight division, with Tyson Griffin (probably no relation to Forrest) taking on Clay Guida. Now this was a fight. Both Griffin and Guida displayed each and every one of their skills to the fullest in a bout that saw nobody gain the advantage for any amount of time, and they managed to keep up with a furious pace throughout the entire three rounds. We saw it all here, and it made for a hell of a fight, and it was a shame that, as the old saying goes, there could be only one winner. That man was Griffin, winning via split decision. If you want a perfect example of what mixed martial arts is all about, then this is that fight. Back into the middleweight division next, with Jason MacDonald facing Rory Singer. While not as action packed as the previous fight, this was still a great technical battle, and, also like the previous fight, both guys used their counter-techniques extremely well. Singer was doing a tremendous job controlling MacDonald, only for him to lose control of the guard, giving MacDonald the mount. As MacDonald reigned down a series of blows, all Singer could do was try to defend himself. With Singer offering no offence, the referee had no choice but to stop the fight, MacDonald getting the TKO win. Then it’s up to the light-heavyweights, as the ever popular Forrest Griffin takes on Hector Ramirez. Having lost his previous bout against Keith Jardine, Griffin wanted to put on a show. This was Griffin back to his best, and a more intelligent Griffin at that, not taking as many risks as he did before. No matter what Ramirez did, Griffin always seemed two steps ahead of him, unable to keep up with Griffin’s punches and kicks, and it was no surprise that when the fight went to it’s three round limit, Griffin got the unanimous decision. A great performance from Griffin here. Main event time, as former Middleweight Champion Rich Franklin takes his next test on the comeback trail against Yushin Okami. There was definitely a mixed bag of action in this fight. The first two rounds hardly set the pulses racing, and Okami seemingly happy to counter anything that Franklin tried, and it wasn’t until the third that Okami finally leapt into action, taking Franklin down, and almost getting the submission with a kimura. But Franklin was able to get out of this attempt , and the round finished with Franklin regaining the upper hand. In the end it wasn’t a surprise that Franklin got the unanimous judge’s decision, although I had to wonder what would have happened if Okami had actually done something in the first two rounds. With time left to kill on the broadcast, we get a pre-show fight, as Marcus Davis goes up against the Scouser Jason Tan in the welterweight division, which saw Davis get the TKO victory in the first round. In conclusion - a couple of days ago I saw an article on an MMA website saying that the UFC were putting on a weak show in Belfast. Well, it may have been lacking names that are familiar to the British public, but it did put on another great show. Tyson Griffin and Clay Guida was a fine advertisement for mixed martial arts, and namesake Forrest Griffin again showed just why he’s one of the most popular UFC fighters at the moment. The main event may have been a little lacklustre at times, it delivered in the end, and it was well worth paying for the privilege to see this. (Although I didn’t actually pay myself!) 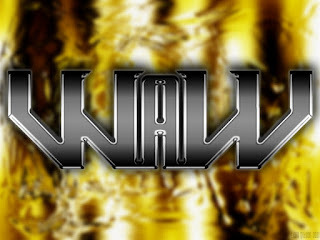 So thanks for bringing the show back to these shores again, Mr. White. Shame you’re not coming back until September though!